Can't attend? Follow WOAH Festival to know of future events! 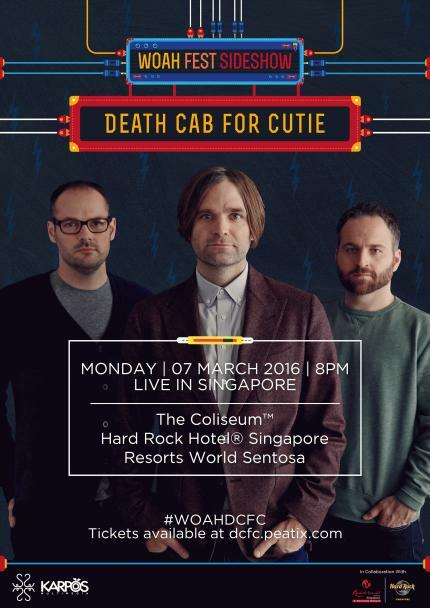 Indie-rock legend DEATH CAB FOR CUTIE will be playing live at The Coliseum, Hard Rock Hotel, Resorts World Sentosa Singapore on March 7, 2016, 8PM! Be part of the music history as Ben, Nick and Jason play their 8th album, Kintsugi, for the Singapore crowd for the very first time. Death Cab for Cutie is composed of Ben Gibbard, (vocals, guitar, piano), Nick Harmer (bass) and Jason McGerr (drums). Death Cab for Cutie knew immediately that 'Kintsugi' would fit perfectly as the title of their eighth studio album. A philosophy derived from the Japanese art of repairing cracked ceramics with gold to highlight flaws instead of hiding them, 'Kintsugi' speaks to the way an object's history is part of its aesthetic value. Long before they gave the album its name, the band embarked on a process that forced them to do things differently than they ever had before. They had always preferred to hone their arrangements separately, or with just two or three of them playing at once. But when it came time to record Kintsugi, they went into the studio with the openest of minds. Death Cab for Cutie’s performance at WOAH Fest 2016 Sideshow will be one that you wouldn’t dare to miss.